One of the reasons I like to re-purpose my cookie cutters, other than it's so much fun, is that the cutters I want don't usually exist. Take Easter bunnies for example. 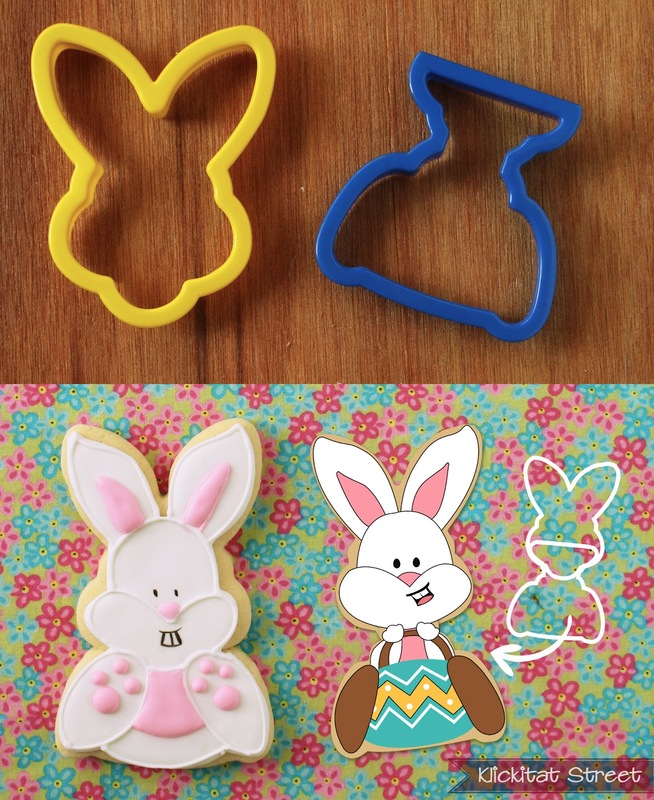 Most bunny cookie cutters look more like they should be rabbits at a garden tea. They are tiny, dainty little things and maybe it's just me but "tiny" and "dainty" don't do the Easter Bunny justice. Of course I couldn't just do one bunny I had to do 12 different ones. 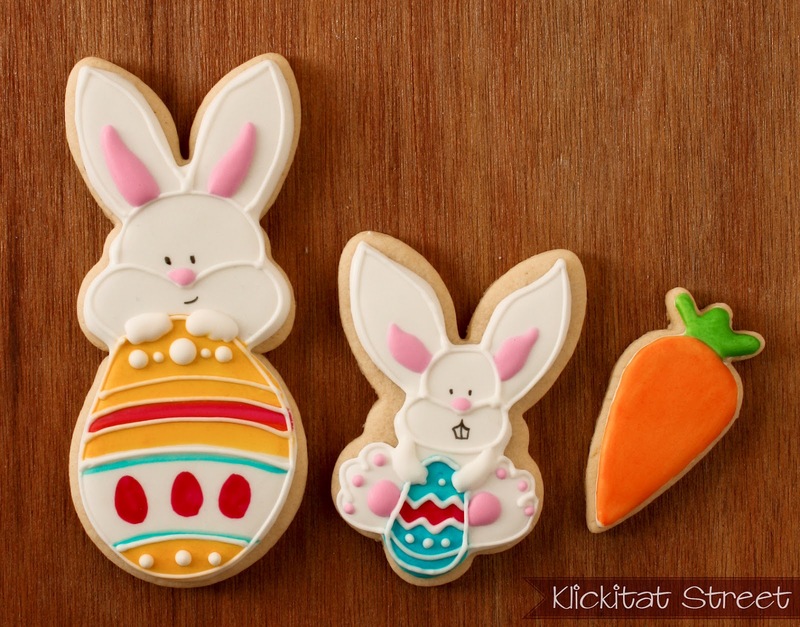 Plus I thought of a few more bunnies after I was done with the cookies so I added them digitally. I hope you don't mind! 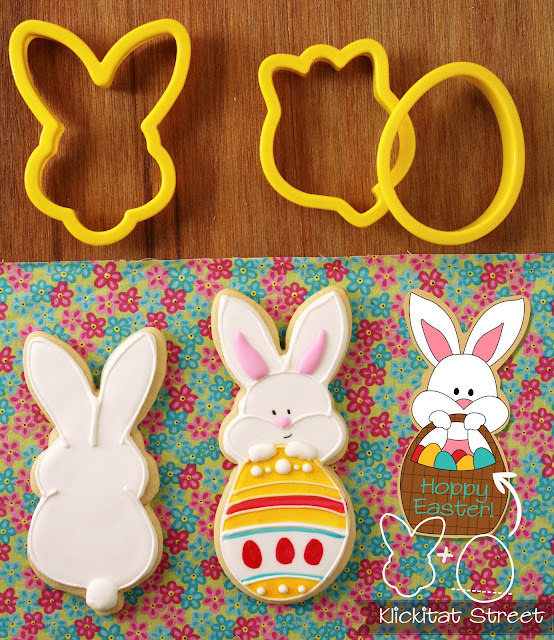 The classic bunny face cutter is a popular Easter cookie but who says it has to be just a face? For full Easter bunny effect though you really need to give the bunny face a body and there are so many choices! 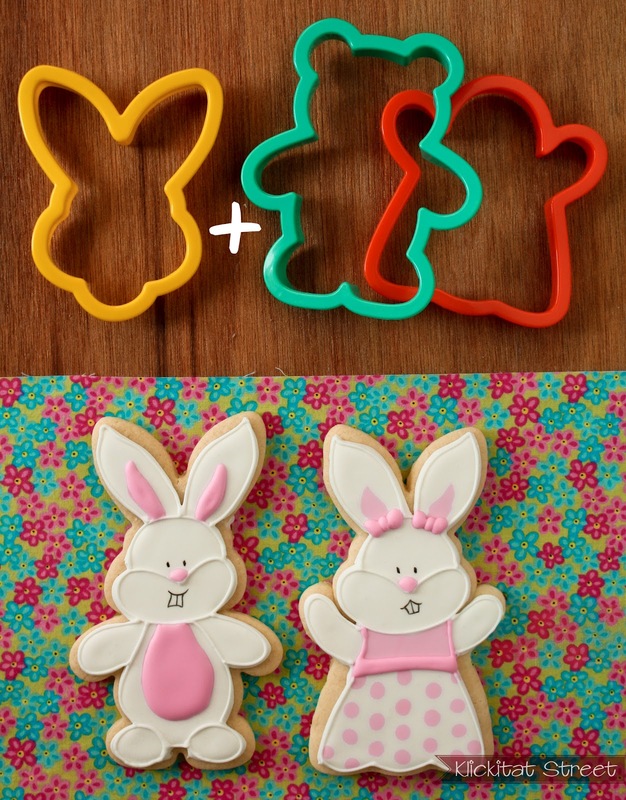 These cookies are made by piecing two shapes together in a similar way that I did with this Valentine set. A tulip or an egg cutter usually come in a spring set of cutters and they make for great bodies. If you trim a little off the egg, you can have a bunny with a basket! 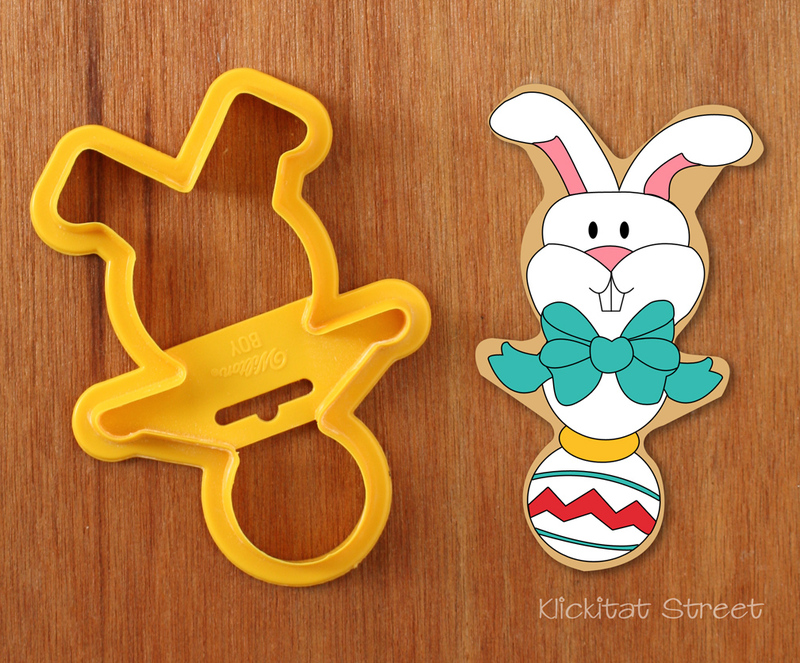 The trophy cutter makes for a great sitting bunny when paired with the bunny face. You could also use the butterfly cookie cutter from your spring cutters but I found the trophy worked better. Or you could turn it into a bunny mobile! Because everybunny needs a little transportation. Of course you can always piece the bunny face to a full body. I must warn you though these are huge cookies! 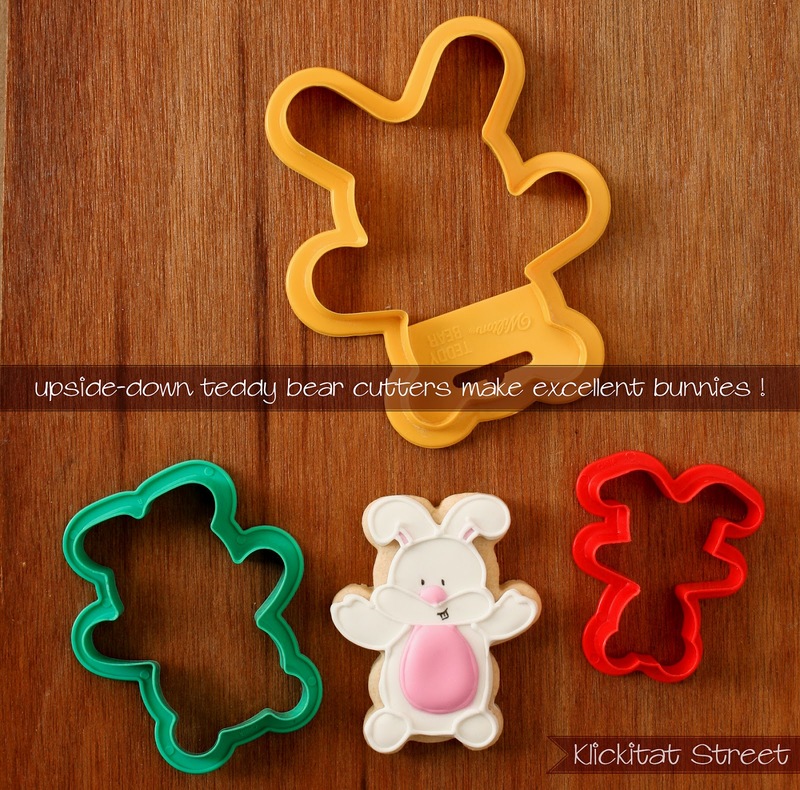 A ghost cutter makes a nice dress for a girl bunny and a simple teddy bear cutter makes the perfect body for the classic standing Easter bunny. Speaking of teddy bears. Most teddy bear cutters flipped upside down will make great bunnies. Especially if their legs are all akimbo. I think the Wilton bear is a better bunny than a bear actually. Hehe, okay maybe not. But if you ever need a bunny baby rattle cookie then I've got you covered. 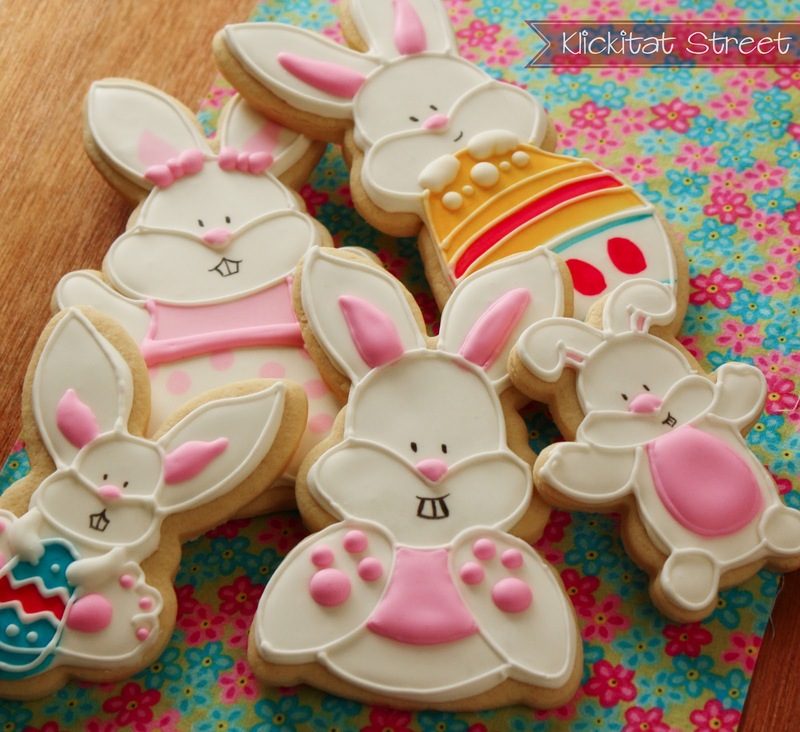 All of the cookies were made with only the two icing colors, pink and white! To add other color here or there I just painted the cookies with a brush and food coloring because sometimes I'm lazy like that. I figure they're Easter eggs so they're supposed to be painted right? Maybe one day I will learn to not get so carried away by my ideas but that day is not today! I hope you enjoyed all the bunnies! You continue to amaze me! So very cute! Sarah...you have a BIG fan here :D Do you have a background in design or art? I just love all your designs! Keep the ideas coming!!! We are lovin this. You are so awesome!!! You are amazing!!!!! How do you get your bunny's so perfect? are you able to do this free-hand, or do you draw them or use a projector!! oh ya and some of the bunny heads are so big, ackward and not cute - you did a great job fixing them! I am so glad I came across your site! Just amazing, creative ideas!! I have all those cutters. I was just organizing them into bins tonight because they were too cluttered in the big jar they came in.. I wish I had your brain because all I see is what they are. I love your creativity! OH I just wanna follow you around all day and tell you how cool you are...and I love it that you overdo! You are inspiring!!! You have the gift of vision, seeing beyond the standard use of a cutter. Your combos create some adorable bunnies, and the painting is amazing. You're such genius! I'm overwhelmed by your ideas!!! Every time I look at my cookies cutters, I try to think as if I were you!!! !Thank you for sharing!!!! I love your ideas- and I had no idea you could use the icing colors as paint- will have to do that! Yes! How do you use 2 cutters together, and get the cookie pieces to bake together right? Does anyone else see Olivia the pig in using the bunny cutter? Hehe, you could totally use the bunny face to make Olivia! Those are ADORABLE!! Thanks for sharing! I recently found your blog and have become a follower. Thanks for sharing your creativity with those of us who love making cookies for our families, but just don't have the vision to see beyond the actual cutter. I made some bunny/egg cookies and the chicks in a nest thanks to your tutorials. The ghost is from a big tub of cutters by Betty Crocker. Here in the United States we get them in stores with the Christmas stuff. You could also try searching eBay just for the Halloween ones because some sellers get the tub and then split them up by theme.